"K" - Chapter 1: "Strange Favor"
Superman and Batman watch from a distance as a movie about their adventures is being shot. Batman is unhappy at how much the filmmakers are getting his origin wrong while Superman is more amused than anything else. Suddenly Livewire appears and tries to take the actor playing Batman hostage. Superman leaps into action and he and Livewire face off briefly before a stray bolt of electricity causes the prop Kryptonite, which is actually real, to explode and shower the Man of Steel with Kryptonite fragments. Batman calls in helps and after defeating Livewire the Flash gets Superman to the Fortress. There Alfred operates and Superman pulls through. Batman leaves and Superman soaks up some solar radiation. Later, Superman travels to Gotham City and asks Batman to help him round up all of the Kryptonite on the planet. Batman agrees but after a comprehensive scan of the planet discovers there is far more Kryptonite than they had imagined. Story - 4: I can't believe it. I just flat out can't believe it. 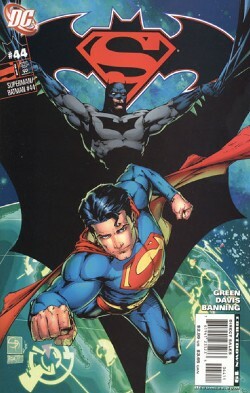 I liked two issues in a row of SUPERMAN/BATMAN. After more than a year of reading stories that I disliked to one extreme or another I am jazzed about this book again. I don't know if this story is going to hold up over the course of however many chapters this arc has but wow this issue came out swinging and ended on such a great cliffhanger. Normally I am hesitant when a writer who doesn't appear to have a vested interest in a title, whether they come from novel or television writing, comes on to a book. It just makes me nervous. I am the type of fan that likes to see a writer and an artist come on to a title and do their best to make that book the best it can be and really develop the characters to the point that when that team eventually leaves you are almost sad to see them go. This book has unfortunately become a rotating creative staff comic and because of that I can't invest in it like I want to. Michael Green, though, gives us a story that not only had good dialogue where the characters were in character but some humorous moments and a really solid plot to hang a story around. The issue started off great as we see that disappointing super-hero movies are not the exclusive domain of our Earth. I liked seeing this supposed World's Finest movie not only because it was funny but also to see Superman and Batman's reaction to it. The origin they give Batman in the DCU World's Finest flick was terrible and reminded me of some of the Marvel television pilots of the late seventies where the origins were not only altered but were sometimes terrible. This was followed by a very satisfying action scene and a quick guest spot by the Flash. Sure it featured Livewire, who I hate as a character, but it was a well written scene nonetheless. Afterwards we get what I think is a very realistic depiction of what Superman might do after such a close call. One has to wonder how the movie people got the Kryptonite. Well, I don't wonder. As Superman points out the stuff is everywhere, but you would think that once word got out that they had real Kryptonite one of two things would happen; either every two-bit super villain with a beef against Superman would storm the set or some members of the League would arrive to have a very polite conversation with the director. I see this as the one flaw of the issue and I think they could have gotten to where they needed to get in a more imaginative way. But that was the only misstep. Green plays Superman and Batman well and gives them real personality. The scene with Superman and Batman in the alley was enjoyable only because Green captured how well these characters knew each other. His characterization of Alfred was a tad off, but accurate at the same time. This all led to Superman's request to find all of the Kryptonite on Earth and get rid of it. It's nice to see a plot get revealed so organically. From beginning to end I liked this issue. I really hope it continues. Art - 3: Liked the writing. Didn't really like the art. Davis and Banning have some funky looking characters in this story. There were some nice bits here and there, but there were times when I thought I was reading an indie book from the mid-eighties and not SUPERMAN/BATMAN. Oh well, I couldn't like the whole thing, could I? Cover Art - 4: Luckily the cover was one of those instances where Davis and Banning got the characters right. This is a nice piece of art. Sure they kind of cheated by not showing Batman's legs but Superman looks pretty good. I mean he looks like he needs to eat something, but he looks good nonetheless.